BEHR Premium Quick Dry Oil Base Wood Finish is a revolutionary, breakthrough product that allows you to prep, stain and entertain all in the same day. This unique wood finish features damp wood application and dries dramatically faster than traditional oil wood finishes. It quickly penetrates the wood surface and provides early rain resistance. It is our Most Advanced Oil Formula and is excellent for use on decks, fences, and siding. Note: This is our initial test of the BEHR Premium Quick Dry Oil Base Wood Finish. It came out in Spring of 2017 so we will update as needed. – We used the Clear which is not Clear but tinted yellow. We understand that it has to be tinted to achieve UV protection but it is deceiving to consumers to call it Clear when it is not. The yellow color was not natural looking as well. Numerous complaints about appearance and colors on the Home Depot website for the BEHR Premium Quick Dry Oil Base Wood Finish. – Very faded after the first Summer and Fall. It will not make it two years. Behr warranty states 1 year only as well. – After the first season, the BEHR Premium Quick Dry Oil Base Wood Finish showed some wear in traffic areas. About 20% of the deck had issues. – BEHR Premium Quick Dry Oil Base Wood Finish costs $42 per gallon. We used 3 gallons for the 300 square feet. Nowhere near the claim of 300 sq feet per gallon. – No issues after the first season. – Applying the BEHR Premium Quick Dry Oil Base Wood Finish is not as easy as it should be. Color is “too rich” and gummed up in our paintbrush. It was difficult to apply evenly and showed some overlap marks. – BEHR Premium Quick Dry Oil Base Wood Finish does not darken in color much or at all. – N/A as of yet. 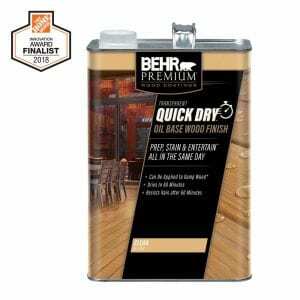 – BEHR Premium Quick Dry Oil Base Wood Finish is very new. We have never been fans of the Behr Deck stain products and this is not any better. We love the idea of doing a deck in a day but there are better products for this (see Restore-A-Deck Wood Stain). It is very expensive for a 1-year warranty product. We suggest reading reviews online from other websites as they will collaborate with our experience and numerous consumer experiences with this. *All products tested and results are from our hands-on experience. We offer no guarantee of similar results. Take into consideration that results may differ widely due to different wood types, exposure to UV radiation, and natural weathering.